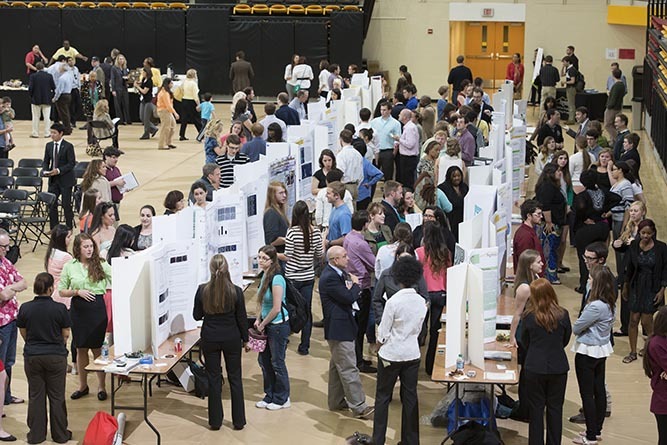 Co-sponsored by the Undergraduate Research Club and the Office of Undergraduate Research, the Symposium of Student Scholars is an event to showcase student scholarship conducted at KSU during the past academic year. In previous years, we have had a great deal of disciplinary diversity in projects presented, including readings of new works from authors, performances of new compositions from musicians, explanations of curricular innovations from educators, innovative business models from entrepreneurs, urban landscape analyses from geographers, and a wide variety of scientific research papers. The Symposium of Student Scholars showcases research conducted by ALL KSU students, not solely undergraduates. KSU graduate students are encouraged to present the results of their research projects. Their work will be designated as "Graduate" during the poster and presentation sessions. **We encourage ALL KSU students engaging in research/creative activity during the last academic year to submit their projects to the Symposium of Student Scholars. Even if you are unable to physically present your work at the Symposium, your project and the names of all authors and co-authors will be recognized in the program. Past programs for the Symposium of Student Scholars can be found here. Past presentations from the Symposium of Student Scholars can be found here. Deadline for Submissions: March 19th, 2018 at 11:59 p.m.
A separate form should be used for each individual project. All projects submitted will be recognized in the program. Those students choosing to present at the Symposium will have their abstracts published in the program. We encourage ALL graduate and undergraduate students engaging in research/creative activity during the past year to present their work at the Symposium, showcasing all of the great projects at KSU. Proposals can be submitted as 15-minute oral presentations, performances, art displays, or posters. Posters can be printed for free here: CETL Poster Printer. Please complete this form even if you are unable to attend the event. We would like this program to be a comprehensive list of all student research and creative activity conducted at KSU during the past year.